Been wanting to post since I got back from Mexico … however its been busy, busy, busy. Had to find a minute to tally up what I’ve been up to. Most I can’t share the visuals for, given they are private coaching and training clients. However here are some blurbs, that give a sense of what I’m up to in my practice. I’m trying to get in the habit of documenting my work to some extent, so I can reflect back to myself what I am doing. I am very in the now when I work. However when a client session is over, I go onto the next one. And am very in the now with that one. Some of this work is extremely moving and leading edge (tooting my own horn I know, but it is). However it whips by as I go from session to session. Documenting helps me see the patterns as they are unfolding. And eventually I’m going to have to write my work up into some sort of document and/or book. I’ll be organizing it for the viewing of my Visual Coach students. And maybe for more mainstream publication down the line. Step by step. For now its all I can do to get through my busy weeks! SHIFT-IT eCommunity (November’s Drop In Webinar): Orphan Rescue: American Accountant. Book on Women and Money. Rescued 9 Year Old Self at Kitchen Table with Dad (Mixed messages about women and money … control/dependence). Compassionate Depossession: Canadian Healer / Law Student. Indigenous. Hwy 16. 4 Missing/Murdered Women. Pyschopomp assistance (transitioning to Upper and Lower Worlds). Magic Marker Mastermind (Fall Online Class: Session 8 of 15) Fall’s Cohort of Graphic Facilitators and Graphic Recorders. Feedback to New Zealand Leader on His Latest Murals. Business Coaching for Seasoned Canadian Consultant Selling an Aspect of Her Business. Assistance to American Graphic Facilitator and Trainer on RePositioning of Her Brand. Fundamentals of Working Visually (Fall Online Class: Session 11 of 18) Feedback Session on Prior Graphic Recording Assignments. What’s Do You Like About the Experience? What Are You Learning? What Would You Differently Next Time? The Only Way Out is Through … Keep Practicing! Fundamentals of Working Visually (Fall Online Class: Session 12 of 18) Our Trek Through the 4 Main Ways of Working Visually Continues. Introduction of Visual Process Work with Groups aka Graphic Facilitation … the 3rd Animal of 4. Overview, Portfolio, Templates and Demo. Assignment: Creation of a Template To Be Used With a Group. Private Coaching Session: American Accountant. Spirituality choked. Throat chakra. Sound. Voice. Tone. Resources for Consciousness Expansion (Joan Harrigan, Batgap, Gaia TV). AlphaMind: Abandoned feeling (not using). Wolf (guidance)l, Pulled Cards: Elevator, Orange, Healing Tool. Homework: Female Guide / Blue. Private Coaching Session: Canadian civil servant. Community Dev specialist – broadband. SHIFT-IT client – segue to self employment. Vision (Future Self). Action Plan. Orphan Rescue: 10 years ago, single parent of 3 kids. Orphan put in recovery in Bali (vacation for good work). Future Self reassures Now Self that its just temporary discomfort. Save her money. Plan. She’ll get out. She’ll become the stable FS soon enough. Private Coaching Session: American academic. Move/transition. Vision: independent consultant: Visual Storytelling and Branding. Block – afraid she’s going to die. Compassionate Depossession: 12 Year Old Suffering Being – spirit of deceased child. Seeking comfort and beauty. Psychopomp work – transitioned her through portal. More beings watching the process. Client will do CD on the other beings – use Freya as the psychopomp in charge. Private Coaching Session: Consultant. Specialty in Community Development / Disaster Response. Completed book. Doing presentation at university. Consult on how to do that visually using interactive methods that do rather than just talk about. Private Coaching Session: Canadian college professor. Indigenous woman. Series of sessions to soothe body image, sexuality,male gaze, indigenous targeting. Orphan Rescue: Aunties and their experiences at residential school. Orphan taken to AlphaMind – boundaries set. Boardroom conference in AlphaMind with other parts to weigh in on topic at hand. 2 Day Private Training in Visual Skills: Millennial indigenous woman. Flew in to Victoria, BC for training intensive with me. Works for a First Nations agency. 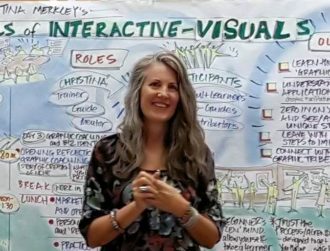 Employer paid for her to receive my direct training to develop in-house Studio Work and Graphic Recording capacity to apply to wide range of workshops and hosted events that they offer to expansive clientele. Exploratory Chat: Chinese business woman newly located to U.S. Launching private consultancy with Pan Pacific niche to assist Cross Border businesses between China and U.S. MBA and Commercial Banking background. Recently discovered Working Visually niche. Discussion around my training and apprenticeship packages to learn visual skills ASAP. Directed to Fundamentals of Working Visually as a first step (will start with Home Study Kit for instant access and take advantage of Free Repeater for possible additional online course attendance in Spring). Exploratory Chat: Canadian Self Employed Marketer. Interested in support for analogous trauma related to contactee experiences. Also wanting to discuss green energy, free energy and other disclosure related topics. Looking for coaching support to shift her current marketing business towards sustainable energy start ups, entrepreneurs and mid size businesses, Directed to SHIFT-IT Visual Coaching packages and/or private distance coaching. Exploratory Chat: American Human Resource and Communications leader. Looking to better understand the visual methodology for application in her organization and in her side private practice (coaching). Possible candidate for Visual Coach Certification. Getting SHIFT-IT and Fundamentals of Working Visually prerequisites first. Private Coaching Session: American independent consultant/coach. Working way through 12 Pack of distance sessions with me. Mid way through. Single mother phase ending as child going to college. Home design and renovation considerations given new stage of life. Old Work / New Work dilemmas. Old Being and New Being. Body Talk Session revealed Constellation as preferred modality to tackle presenting issues. Powerful session which revealed movements resulting in integration between old and new ways of being. Cool! Private Coaching Session: American Graphic Recorder and Fine Artist. Long term client in midst of latest 12 Pack of Private Distance Sessions. Does double sessions. First session left-brain check on what is happening work/life. Second session is right-brain energy work on how to address energy alignment connected to what is happening in the now. She’s working on upleveling both her GR/GF work and her Fine Art into more lucrative and wealthy circles. And also moving from GR into being Confident, Lead Facilitator. Cortices. Clearing. Constellation Session (spacial relationship between Now Self and Future Self Who IS a Confident, Lead Facilitator). Compassionate Depossession via Constellation Circle: Constellation Circle I was attending shortly after Remembrance Day. A participants’s son served in Afghanistan. On his last mission something happened where his fellow soldiers died suddenly. Son’s representative was fixated on their deaths. Facilitator felt something ‘additional needed to happen’ so I spontaneously offered my CD (soul transition) services with the group’s energetic assistance. Very moving experience that I feel blessed to have been able to assist with. Right place right time. As you can read … being The SHIFT-IT Coach is not a dull life!